Rotomite maintains food processing waste products settling lagoons. SRS Crisafulli. 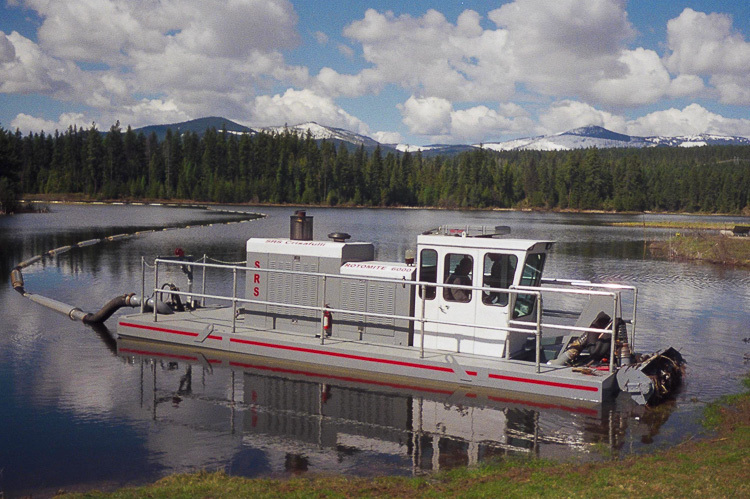 Crisafulli Rotomite-6000 dredging valuable peat in a rancher's lake in Washington State USA. September 2007 A major US food processing company purchased a Crisafulli Rotomite-6000 dredge to replace two existing dredges made by another company, to clean and maintain its factory waste products settling lagoons, and made the following comments about Crisafulli product quality and customer service - "The Rotomite dredge was delivered on time, per specifications, and in good condition; the Rotomite-6000 was good value, performed as expected and met the customer's needs; the Crisafulli sales staff was knowledgeable about the dredge, provided adequate technical information, and Crisafulli's Operation & Maintenance Manuals contained adequate parts/service information". The Customer said that in its buying decision these factors were very important - the Rotomite-6000's performance, product features, price, Crisafulli's warranty, overall quality of the product, Crisafulli's brand reputation, and availability of after-sale service and support. The customer rated these aspects of the Crisafulli's customer service as excellent - employee friendliness and courtesy, employee product knowledge, and ease of purchasing and ordering, and ease of payment. The customer was particularly pleased with Crisafulli service, parts availability, and troubleshooting knowledge of the Crisafulli Factory staff.